Baptism by Tempestuous Green Seawater. So there I was, Green Water sweepin’ the bow. Shark (SSN591) we had to shove the towed array out a tube whose connection to the boat was on the after deck, topside, with a tube that ran down off the starboard side.) The whole contraption relied on two air motors that weighed 85# each, which were removed and carried below, as well as a bag of specialized tools for attaching things, working the air motors, etc. Of especial concern to him was a certain pin spanner wrench – a custom made wrench without which the array couldn’t be retrieved.This was my first time on the rounded deck of a modern nuclear-powered submarine. The sum of my experience walking on a rounded, wet deck of a submarine was precisely one trip aft, one line-handling evolution, and one trip back as far as the doghouse on the side of the sail, where the Tool Bag had come out seemingly of its own accord, like the sword from the Lady of the Lake. I never did tell my chief (whose hand it had been, extended in celestial feminine majesty) of my immediate mental image of the Lady of the Lake. By the time I was convinced that the imagery fit, I had moved on to other insults. But I digress. I returned aft with the natural apprehension of a person who cannot see the shore, is held on to the deck only by a strap he cannot see affixed to his back, to a deck that has no clear boundary between his shoes and the Sea. A man who had yet to learn to trust non-skid. A man who still was convinced that things that didn’t move as you walked along their surface was the norm. A latent Landlubber. And so, I headed aft, towards the rest of the STASS handling party, who stood expectantly waiting on the bag I held. For the first time I grasped a little bit of what it meant to be a submariner – to be expected to succeed. No one expected me to know anything more yet – but they did expect me to learn. I watched, I listened. This thing went here, that thing went there. This tool was used like this – and then went back in the bag. The deployment of the array went as well as I could have been expected to understand up to that point. And then, as the “coffin” that housed the entire assembly was being buttoned up, the sea became rough. Swells began running at our feet down the sides of the boat. 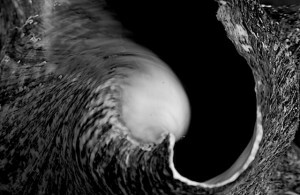 The boat itself began to roll, and the complex mathematics of swells and rolls brought one or two waves right up and into the STASS coffin. Work went through a shift into urgency, those no longer needed went below. But I carried the bag, so I was the last, save for the chief. When the last tool clanked into the safety of the burlap, he gesticulated for me to put some speed on it, and get moving. The man who had dropped that last tool into my possession was already gone with a swiftness I wasn’t sure wasn’t supernatural. I began to shuffle along the deck, saddled as I was with my apprehension of the lack of clear separation between the sea and myself. Well, I thought most of it. But just as I reached the point directly beneath the fairwater planes, hand on the frame of the doghouse door, a giant swell reared up, and I was no longer on the boat. Well, no, I was. Wait, I wasn’t. Nope. Yup. I’m standing on something. No, I’m standing on the fairwaters. I hung on desperately to the bag, which was now directly over my head. Or under, depending on how you want to look at it. The whole wave probably lasted two-three seconds at the outside, but it seemed an eternity. I saw underwater through clear, green. The bag had filled with water, anchoring me to the deck. I suppose technically I could have let go, but there was no chance in hell I was going to tread water for two months diving the floor of the Long Island Sound for tools. My feet floated up, but the safety lanyard on my harness – along with the water-filled tool bag – held me back. As the wave receded I was unceremoniously dumped head first onto the rounded, non-skid-coated deck. My left hand clutched my lanyard, and my right, with the force of an army, gripped the rope handle of The Tool Bag. As soon as I was able to process the fact that I was still alive, not drowned, oriented once again into a world where right-side up was…well, rightside up, I pulled myself to my feet with the left hand and lanyard. Every move I made was gravitated around that bag, and its continued presence on the deck. Carefully, almost reverently, I tipped as much water as I could out of the bag so I could carry it. It took that amount of time for the Chief to retrieve himself from the aft end of the safety track, and tell me to quit poking around and get the hell below. The next swell was coming, and nearly caught us out again. I learned a lot in those few seconds – an awful lot. I learned how fast I could move on the rounded back of a submarine. I learned how much I was depended on to do the job I was given. I learned how far I would go to do it. I learned that even a nub bears more respect than a non-boat sailor. Until he fails, he is expected to succeed. And between you and I, I learned that my chief could squeal like a girl. Just before getting doused, I thought I heard the sailplane door squeak, but I realized it was my chief, behind me, anticipating getting dunked. We all have our “foxhole” prayers and baptisms by fire and seawater. And sometimes they are voiced with the squeal of a little girl. I’m not in a position to judge. Great story! I was on a submarine once. I’m not sure which one…the USS Darter, I think; but it could have been the USS Tunny. I had dinner in the ship’s mess. I only remember the ice cream…yum! I was probably 4 or 5. It was in Port Hueneme where I was born at the Naval Dispensary in 1953 to Mr. & Mrs. Gilbert ‘Gil’ Perry Shaddock.